Here’s our fantasy premier league tips forwards GW8 article in our player rankings series. There’s a table of stats to help you make a transfer choice. No comments on each player in this article due to time pressure. I’ve started with a selection of forwards that I think will start GW8 and have some longevity in the team. 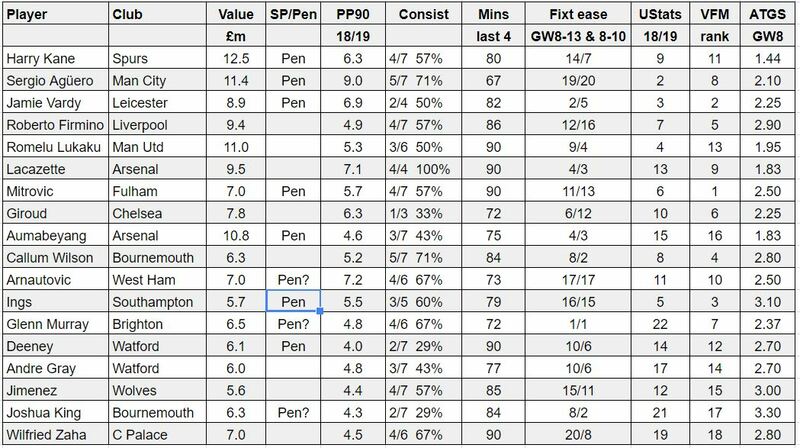 SP/Pen: indicates whether the player has some set piece representation or penalty responsibility. A question mark means there is some doubt over the responsibility. Player values are as of Thursday. Shouldn’t there be a question mark next to Arnautovic regarding his penalty duties since Noble reportedly said it was a one off case?